The average soldier carries at least 60 pounds of gear, with some specialized fighters carrying loads almost twice that weight. A significant portion of this is body armor. Typically made of a combination of ceramic and polymer materials, body armor worn by infantry members weighs about 30 pounds. This equipment is critical for the job, shielding vital organs from the potentially lethal shock of bullets and other projectiles. But even though modern body armor works pretty well for what it’s intended to do, explains Beatriz Medeiros, a third-year materials science and engineering student at the Whiting School, it can be cumbersome. To lighten soldiers’ loads and to improve their protection within military vehicles, Medeiros is working in the lab of Timothy Weihs, a professor in her department, to develop new types of vehicle armor materials. 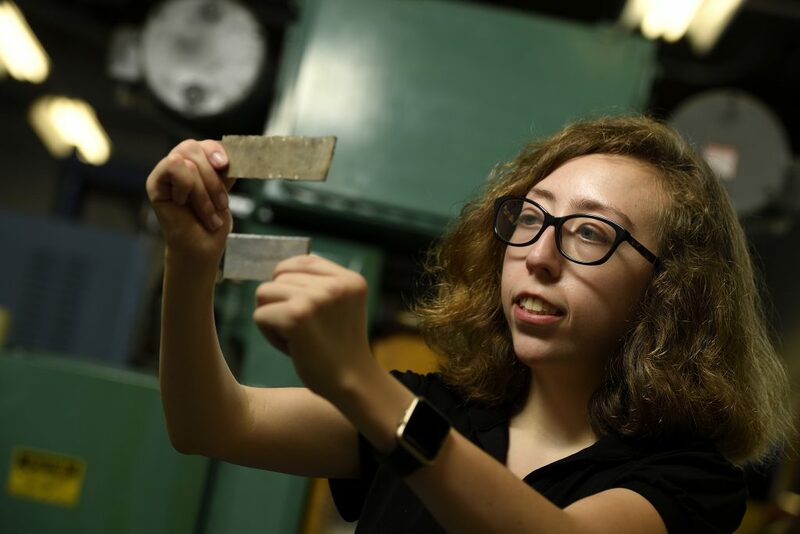 She recently received the prestigious Undergraduate Research Apprenticeship Program internship, which is co-sponsored by the Army Research Office and the Center for Materials in Extreme Dynamic Environments (CMEDE). CMEDE is the Army’s largest, basic research program focused on improving protection materials for military applications and is located within the Hopkins Extreme Materials Institute. Together, these sources provided the financial support that made it possible for her to continue her research at Johns Hopkins over the summer. Medeiros is working to produces an alloy which, after proper thermomechanical processing, can form nano-precipitates that can slow down or block dislocations, the atomic-scale defects in materials that are produced and then propagate upon impact. “A soldier’s job is hard enough,” Medeiros says. “By improving their armor, we’re hoping to make their jobs a little bit easier.”To further strengthen these alloys, Medeiros, under the mentorship of graduate student Suhas Eswarappa Prameela, is exploring different thermomechanical processing methods. These include rolling, which presses the material between two rollers, and equal channel angular extrusion, which pulls it through an L-shaped chamber. Both methods can change the material’s average crystal grain size and precipitate size, which in turn affects its strength. Click here to view all articles in JHU Engineering magazine.